Home»How To's»How Outdoor Talking Platforms are made ? We have the partners to make the actual outdoor platforms, be they in wood, metal or laminates. All you need to do is provide us the 300dpi PDF artwork. We can print up to 70cm wide and 1.5m long (portrait or landscape). Also, on a rough artwork indicate where you would like sound spots. Each sound spot can hold up to 60 minutes audio. We will then do the rest, and supply the platform along with the DPENs. 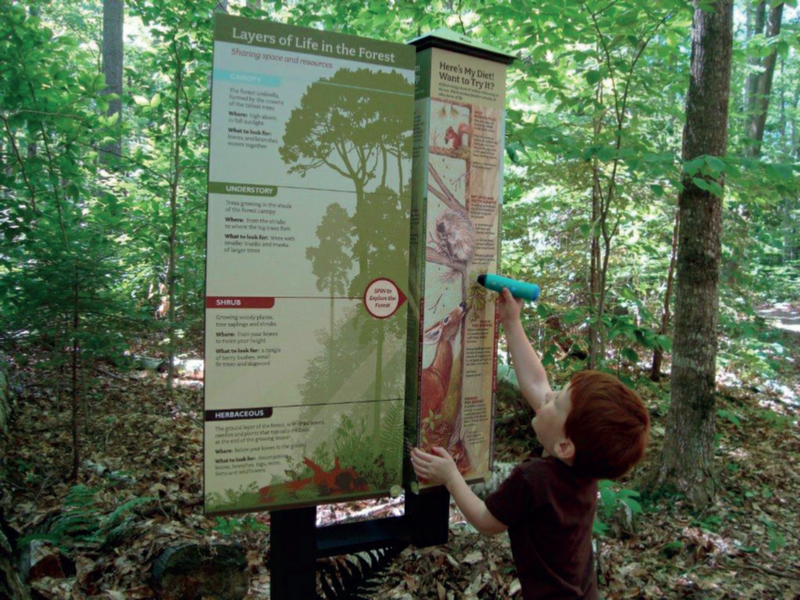 Unlike other interactive outdoor platforms/panels, all the electronics are kept inside the DiscoveryPEN, not inside the outdoor panel. Therefore there are no costs for power cables, outdoor air-conditioning, expensive video screens, etc. Also, the cost of changing audio content is low since you just need to replace the artwork sheet using the DiscoveryLINK process. © Julie Hein-Frank Lake Ledge Naturalist.